My most recent work, Topografías, has been selected for presentation in the Media Art show at the coming X Festival Internacional de la Imagen in Manizales, Colombia. 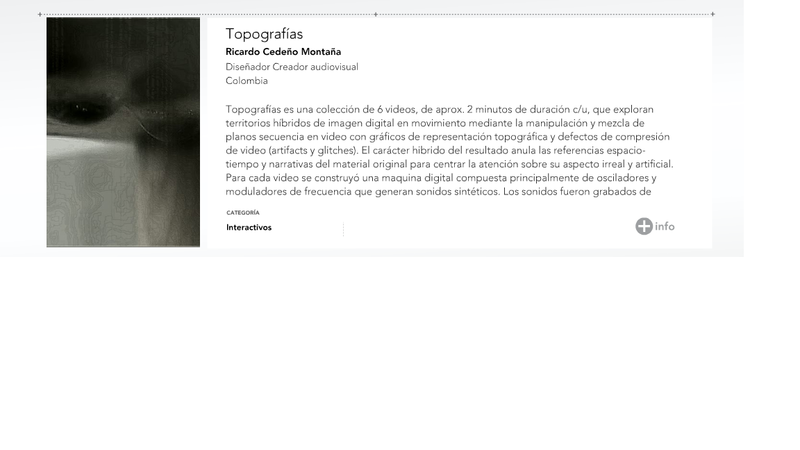 Topografías is a collection of 6 videos, of approx. 2 minutes length each, in DVD-video. This work explores the hybrid territories in the moving image through the manipulation and mix of live-footage with graphics of topographic representations and digital video defects (artifacts and glitches). The hybrid character in the outcome eliminates the spatio-temporal and narrative references of the source material to centre the attention upon its unreal and artificial aspect. For each sound, a machine composed of modulators and oscilloscopes was made. All sounds were recorded in real-time and improvisatory sessions. This series of videos and the final piece in DVD-video was developed using exclusively free software, under GNU/GPL licenses. Codecs and containers for audio and video are free, too. The platform for production was openSUSE; video editing, mix, and composting was made in Kdenlive and Avidemux, and oscilloscope machines were built on Pure Data. All source files are available for downloading at Topografías. Caso cuatro de topografías de video digital y topografías de sonido sintético. Fourth case of topographies of digital video, topographies of synthetic sound. Cedeño Montaña, Ricardo. <em>Topografía lenta tres</em>. 2010. Digital video and audio. Caso tres de topografías de video digital y topografías de sonido sintético. Third case of topographies of digital video, topographies of synthetic sound. Cedeño Montaña, Ricardo. Topografía lenta tres. 2010. Digital video and audio. Caso uno de topografías de video digital y topografías de sonido sintético. First case of topographies of digital video, topographies of synthetic sound. Cedeño Montaña, Ricardo. Topografía lenta. 2010. Digital video and audio.